I can't tell you how disappointed I am with a brand new computer that the school recently bought to upgrade the old donated dinosaur I had (with windows 7). Windows 10 and Edge after all are suppose to be the fastest browser... or so they say. Not only is it slow, but it also seems to find every possible glitch on almost every web page I go to. It's continually sending to Microsoft to find out what the issues are, but continues to defy my commands to go to even something as simple as Photobucket. I also noticed that Microsoft intrusively capitalizes it own name... even when making this post. As a protest, I tried to purposely use a small m and it corrected it every time. There isn't any other self-correction on these posts. I don't know... maybe some of the problems lie in the Internet being slow for the past couple of days, but my first reaction is give me back my old faithful dinosaur and Firefox. It makes a little more sense now.... why they were giving away windows 10, which I have been trying to avoid until now. It seems like Microsoft also added in more steps to do just about everything, or maybe I just have to get used to it, and it incorporates lots of ads which slow everything to a crawl. Anyway, enough ranting already! I'm going to download Firefox and try this again. Just testing (now on Firefox).... microsoft. Ha... I was right. Edge made the Capitol M correction and Firefox didn't. Not only that, but Firefox is faster! And I haven't even tried putting on an ad blocker yet. This 7th grader already took home her project. Good job on those corners by the way! Yes, I helped install the hinges and I tried to convince her to use the x-carve to carve something on the top and to also line the inside with fabric. Heck, maybe even include finish, but nope... has to go home right now! She was simply too excited to continue. I'm not fighting her... just wishing we could have knocked it out of the park with a few more fancy details. X-Carve "Tips & Tricks" Bold print shows up better on the TV.... monitor. 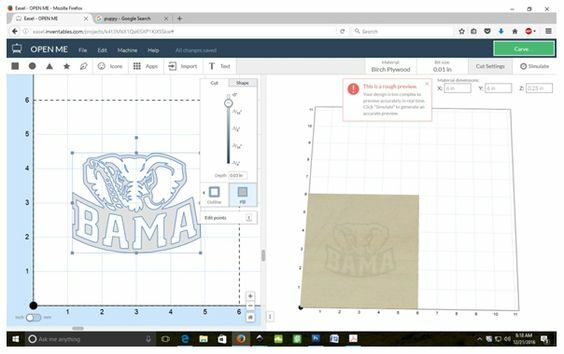 With a new Windows 10 computer, the X-Carve has become more popular than almost anything else in the wood shop... and now I'm having issues keeping up with obtaining materials. Its not that the cabinet shop doesn't give me their cast off before they end up in the dumpster, its that the successful carves require a specific material. My favorite is 1/4" MDF melamine. Wood veneer just doesn't work as well as I thought it would, but it does work, so I at least have that as a back up. I like white melamine best, but even plain MDF works well. White is sometimes hard to accumulate, but lately I haven't been able to get to the cabinet shop to pick up anything. I'm finding that old white board masonite even works well and have recently come across some left over from making classroom white boards. I'm hoping to get to the cabinet shop during Christmas break so I can replenish our MDF supply. I thought you might like to see the instructions I display on an overhead screen near the X-Carve.... so students can work independently. These steps were developed through trial and error and work well to keep projects flowing successfully during the day. Through experience, some students are already able to assist, but even they seem to like being able to refer to these tips and hints. Let's start by finding a graphic using . 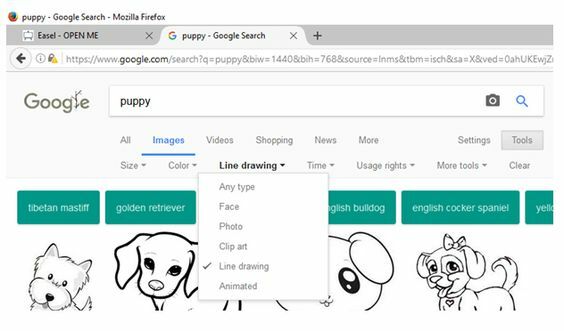 Google has a Tools button to switch the image Type to Line drawing. If it doesn't look like this, get someone to help or call the teacher over. 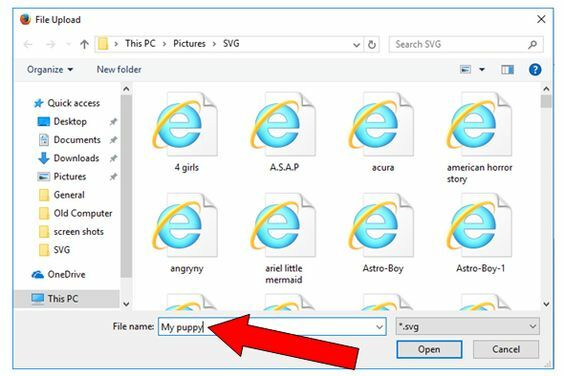 You are not in the right folder. 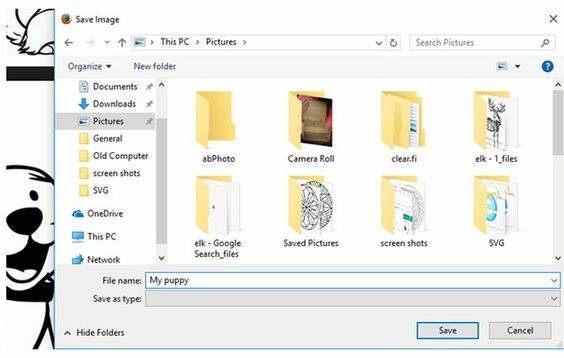 I regularly delete items that are found in the wrong folders, or are left by 8th grade graduates. Click once on the image to turn on the arrows showing it is now active. Go to Path, Trace Bitmap, Update, OK. When trace is completed, close that small window. You will not need it again. 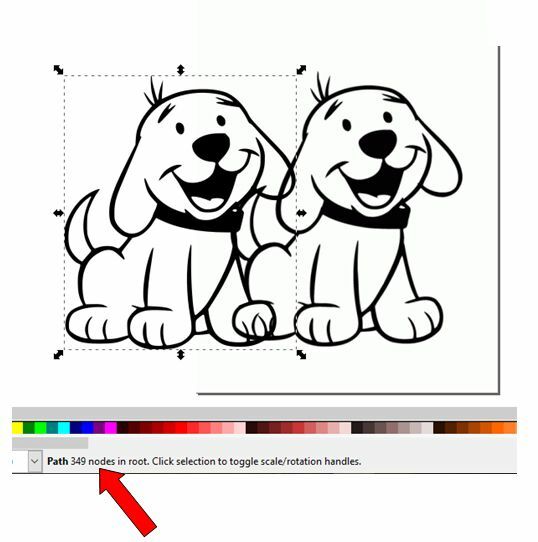 Place the cursor over the image, hold down the left button and slide the image over. As it is highlighted with arrows, check if it says something at the bottom about the number of Nodes. The one that has Nodes is the one you want to keep. 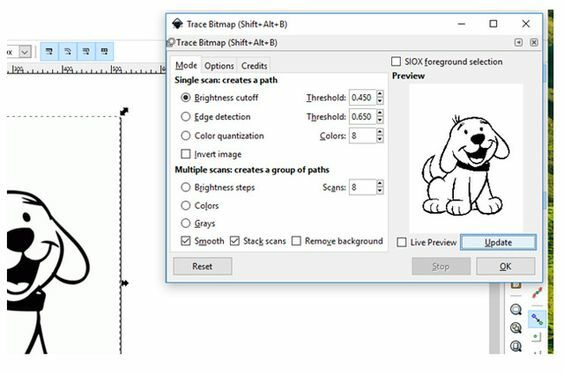 Delete the original image and slide the newly traced image back to the page frame center. If for any reason you can't determine which image to keep, turn on the nodes. With the arrows showing around the suspected image, click the nodes button. If it doesn't immediately show up, a new smaller cursor indicates that you are in the node mode. Click on one of the images lines. One image will show the nodes. 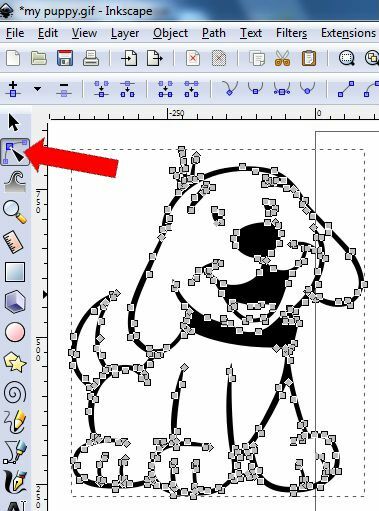 You can also simplify how many nodes are in an image (which can smooth out rough lines) by going to path, and choosing simplify. If any actions drastically change the image in a negative way, you can always go backwards by choosing edit and undo. 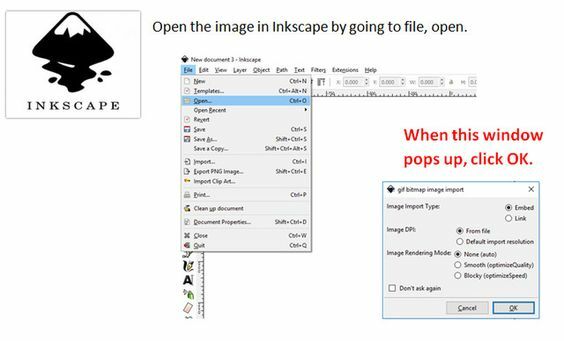 When you have completed your adjustments, go to file, save as… and change it from an Inscape SVG to a plain SVG and don’t forget… to open (double click) the SVG folder before you save the image, or it will be outside the folder and you won’t be able to find it when you need it in Easel. 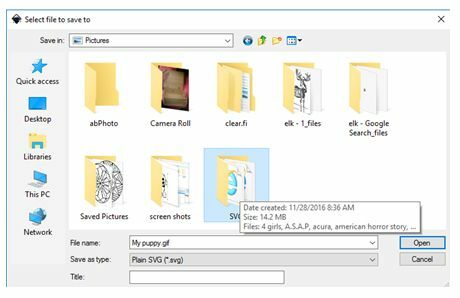 If it still looks something like this, you haven't fully opened the SVG file folder. 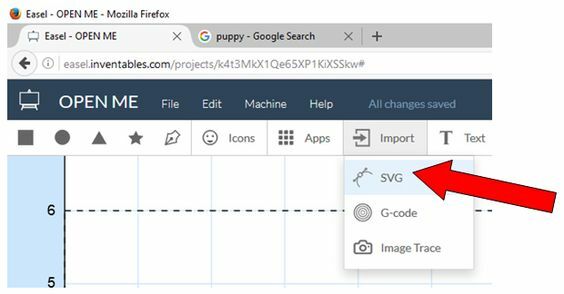 The SVG folder must be open when you save it or you won't be able to find it when you go back into Easel, and that means you will NOT be able to import your image into the project, so.... be sure it looks more like this before saving the SVG image. Once you have Easel open, take a moment to erase any images left behind. We found out the hard way that some images leave behind a few points or small shapes. This can effect your project. To keep that from happening, everything must be removed. 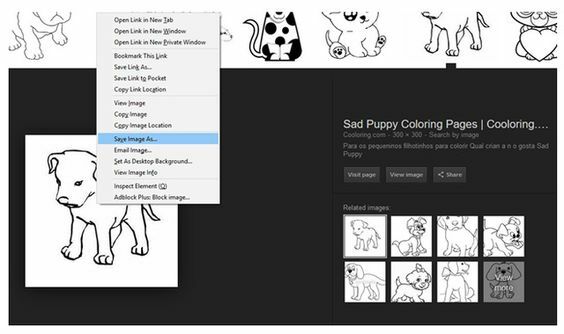 The best way to do this (if you see small images left behind)... is to put the cursor all the way to the top left, then hold the left mouse button down as you sweep down and across the entire image. This creates a blue space as you go. Let go of the button when you reach the opposite corner. The blue disappears, but everything in its path is highlighted. Hit delete and the project space will be completely erased. You are now ready to import your image. Click on Import and choose SVG. Look for your saved image. When the image opens, it can be just right, or very big or small. 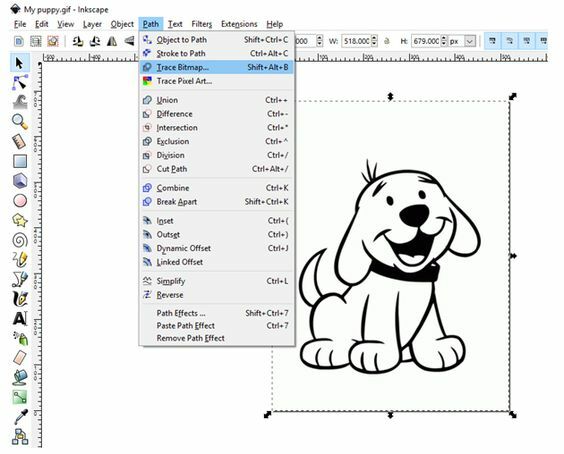 Make any size adjustments, then go to Edit, and click Center to material. With the image highlighted, you are ready to set the depth of cut. It will usually say 0.25 which needs to be changed to 0.02 so the bit doesn’t cut too deep. This will also take less cutting time. Press enter for the change to complete. Go to the upper right hand corner and click Simulate. This will give you a time estimate on how long it should take to run your project. 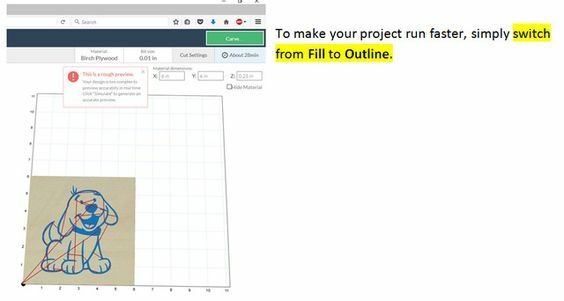 Switching to outline mode will reduce the time from 28 minutes down to 2 minutes... which will allow others to also use the machine during class. Make sure the X-Carve switch is Off to free the motors. 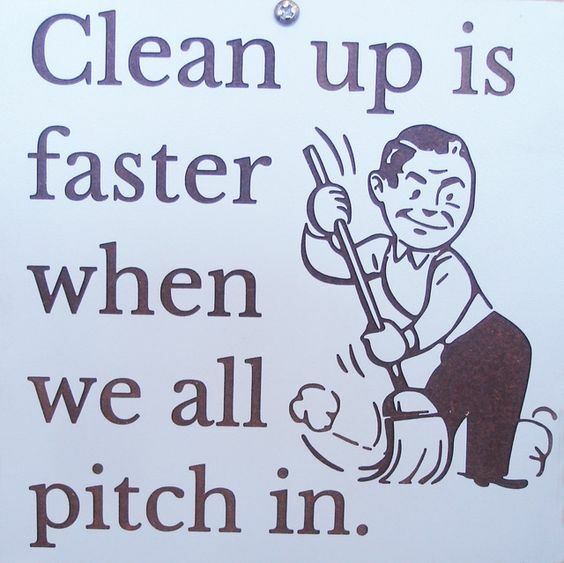 If there is too much fine dust on the rails and down in the corners, take time to clean the machine before beginning. This should be done about every 4 or 5 projects, just so the dust doesn't build up and interfere with how the machine rolls. Hesitation from dust on the rails can lead to offset cuts that ruin the project. First brush off the rails with a toothbrush, then turn on the dust collector (red switch). The router will also start running, so stay back from the blade. Use short bursts from the compressed air to churn up the dust. Long bursts only allow the dust cloud to escape the box. 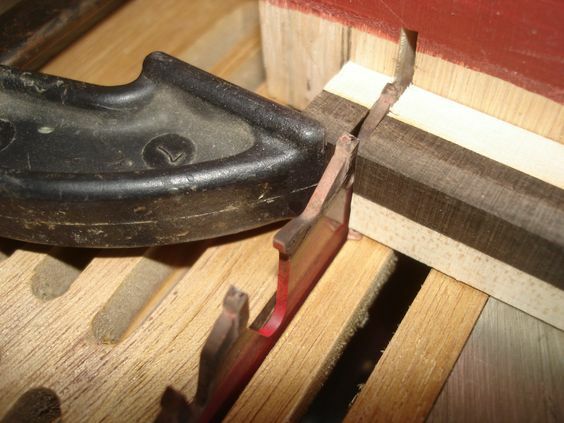 Be sure to clean out around the sides and in the corners. Now turn off the dust collector. 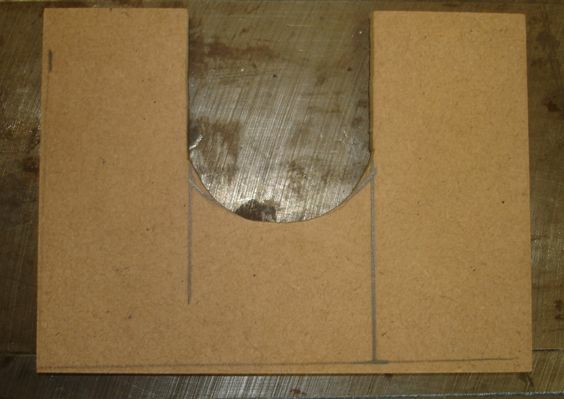 Place a blank piece of material into the project Jig. 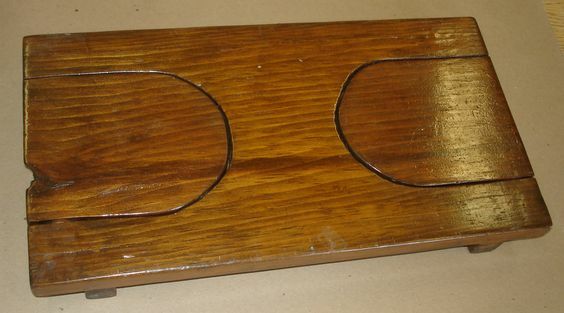 The lower left corner is spring loaded, and the piece should fit snugly into place. 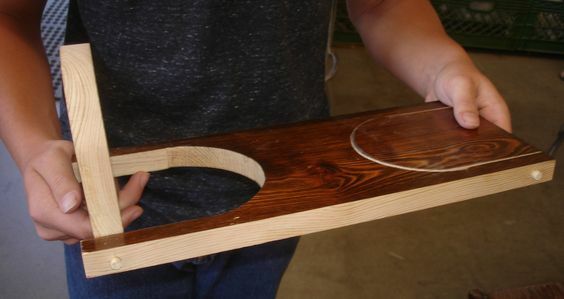 If the piece is slightly loose, a little masking tape at the corners will hold it steady. Turning on the light creates a shadow that makes it easier to see when the bit touches the material. Close the front cover and turn the X-Carve back to On (But don't turn on the red switch yet). You should now be ready to go through the sequence to make the machine carve. In the upper right corner of the computer screen is a green button that says Carve… It is now time to press Carve. 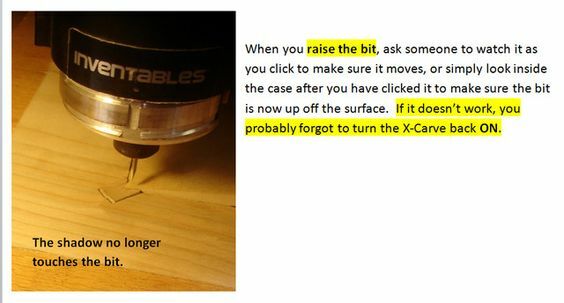 This only works if you remembered to turn on the X-Carve. Easel will take you through the carving sequence. To confirm the project thickness, click the Blue button at the bottom. Next, click on the Blue button to confirm each question as it comes. When you put the cursor on the button, it turns green. 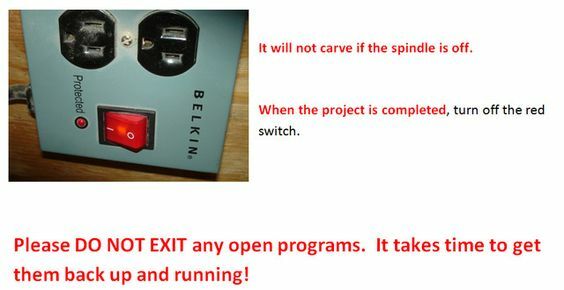 Don’t forget…… when you get to “The spindle is on… “ BE SURE TO TURN ON the RED switch on the side of the plywood box. 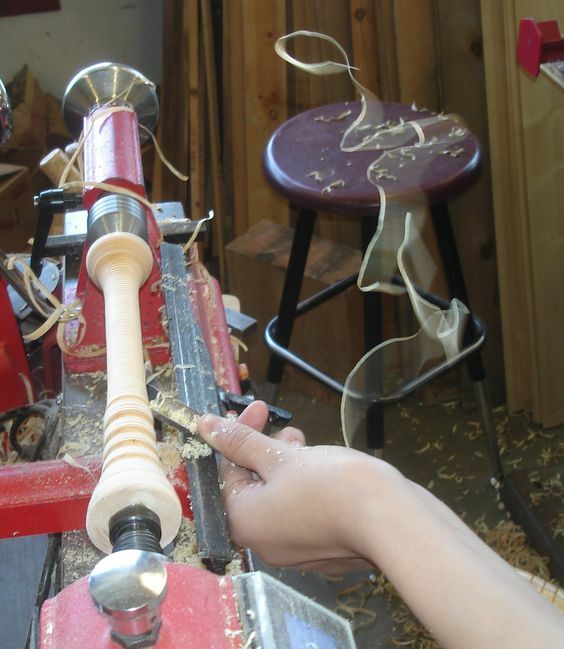 As a few students have discovered, it will not carve if the spindle is off. Back to the last X-Carve post "The maiden voyage". 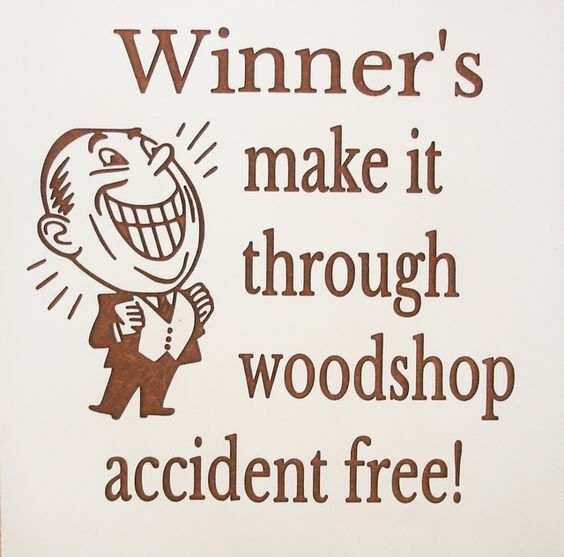 Forward to the next X-Carve post "Making shop safety signs". In this first week of the new year I would have to say, for the first time I've seriously been considering retirement (for good this time), but I don't want to make a hasty decision. It has nothing to do with this great school or the fabulous students and staff. It's simply about all the many physical (mostly age related) afflictions and medications that I've been struggling with that are beginning to bog me down, even as I am looking forward to some very good long awaited news that I'm expecting to hear very soon. But at this moment it's getting harder to keep up the pace. Medications take their toll on ones mental and physical endurance and I feel so different today than I did even just a few short months ago. I believe that it is affecting my teaching abilities. There is still a chance that another recent medication switch may make a difference (actually a big difference), but I won't know how that will be for a few more weeks. It's already beginning to work, and I do know it takes about a month to fully know whether or not I will be able to stay mobile and somewhat pain free at a level that will make it less physically challenging to get back on my feet. You don't usually hear me talking in the negative, but this isn't the first time since being at this school that I've had to fight challenging health issues. However, this one has knocked me for a loop I tell ya. 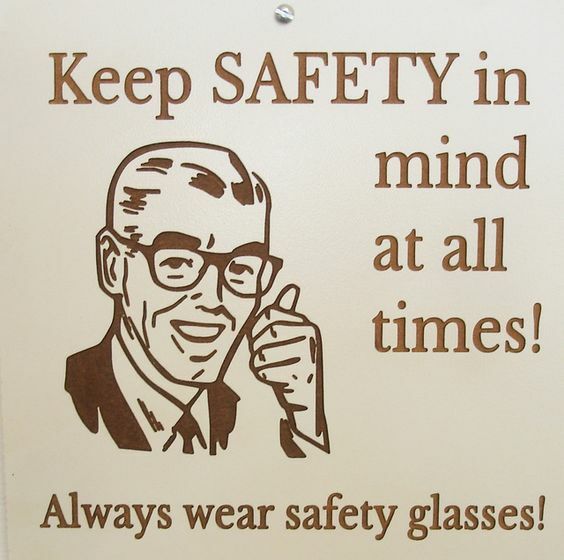 Try teaching as you divide your thoughts between the physical pain you feel and the students you are trying to work with while also considering the safety aspects of each and every hour of each and every day. Seriously, I've been spending more time than ever lately sitting during the day just to get through. I have several larger more challenging classes late in the afternoon that I have to reserve my strength and try to hold onto some energy to be able to cope. It may still take a few adjustments to find the right balance with this new medication, so I can walk freely again, but I'm starting to wonder if continuing is the best idea. You tend to reevaluate your situation during times like this. 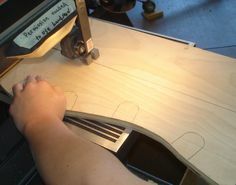 I'm sure some of you have seen my posts dwindle in frequency and have also notice this whole woodworking teachers site is slowing down too. My posts have greatly slowed because I can't stand long enough to develop new projects and templates anymore. Shop teachers are a dying breed to be sure. My only goal when I came to this school was to be "awesome". It was a chance to really make a difference at a small but deserving school. I think when my previous employer came looking to steal me back last year, it was probably one of the higher points in my career. Nothing feels better than to prove their mistake. I have always had health issues (very long story) and some of that is leading up to this, and I never have wanted to leave the school hanging. On every step along this journey I've known (as well as made it known) that it could all end abruptly. Not long ago one of the remaining shop teachers... at another small Charter school.... died. It is for reasons like that, that I made sure to leave a path that someone can easily step into for a seamless transfer and it's not something they couldn't tweak to better fit their style. This thread and these posts are one of those paths, but it is only a guide. I would fully expect them to make it their own experience and not just continue what we have been doing. You've watched as the story unfolded. You've seen the shop get set up. We soon may have a new donation.... an expensive full shop exhaust system. The project templates and jigs are in place. The projects are well tested. The prototypes line the upper shelves. The donated equipment and machines are ready and waiting. The reputation is better than ever. Everything points to success in the future. I guess you will just have to follow along as I keep plugging away while I continue my journey and hope for a better year than the last. Hopefully I will still be posting and maybe even make it through a couple more New Years as the medication is balanced and actually working like it should. I'd like to keep teaching. It can still happen if everything falls into place in the next few days/weeks/months. Wish me luck. All prayers are greatly appreciated. I hope I have made a difference and have been of help to all of you, no matter what happens. All the best for now... and as usual... I'll try to keep you posted. ***UPDATE*** 1-27-17 , Finally.... the good news... "CURED"! And the feet are slowly reacting to the new meds with one adjustment already. Here's hoping it's enough! ***UPDATE*** 2-17-17 , Interesting... I'm suppose to be upping the meds only to have accidentally been lowering them instead, yet my feet are doing better. You might ask... how do you accidentally lower your meds? Easy, when a pill case is concerned. Supplements may be the culprit. When I fill the pill case with supplements, and forget the actual meds, that's really good news in a way because my feet are getting BETTER natually! The future just got brighter today. ***UPDATE*** 3-7-17, Well, the future just dimmed as I now have new issues that are related to, but also different than what else has been happening. Let's hope I can get some good news before school ends. I'd kind of like to stay, but that is again in question. It doesn't help that I am starting to notice my own mistakes. My biggest problem is that I sometimes try too hard to get results. I want to stay if for no other reason than to complete getting the grant and installing a fantastic exhaust system. Not only do I want to use it for a while, but also it would make me feel like I've completed my mission of getting a great program off the ground. ***UPDATE*** 12-17-17 Things are slowly beginning to get better. I think I might be able to stay another year or two, but the school knows that could change at any time. I also got a cryptic message about good news and dust collector. Is it what I've been hoping for? Skip forward to read more about the cryptic message & dust collector. 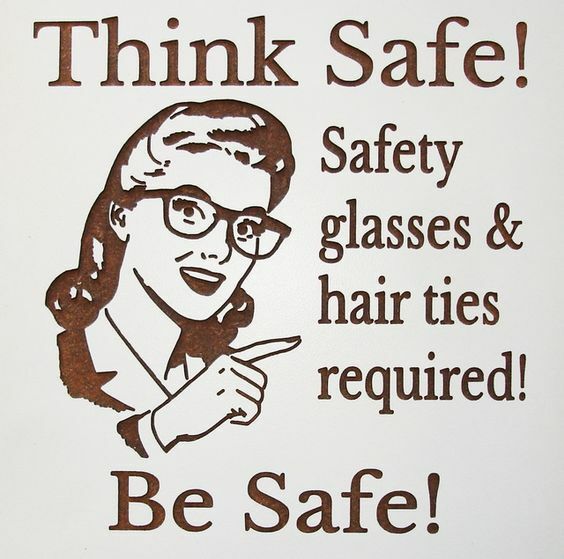 I hope you don't mind seeing a few of my new shop safety signs. 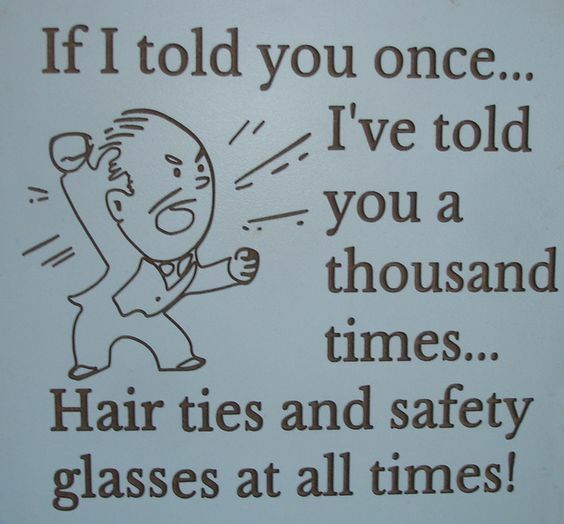 Can you tell which rules I constantly have to remind students about? 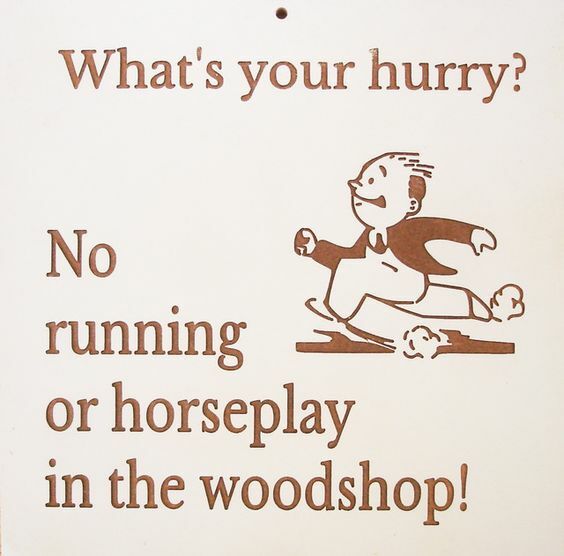 Made on 1/4" gray Melamine, with a dark walnut finish rubbed into the lettering and graphics, these are now posted all over the shop. The students like them too. 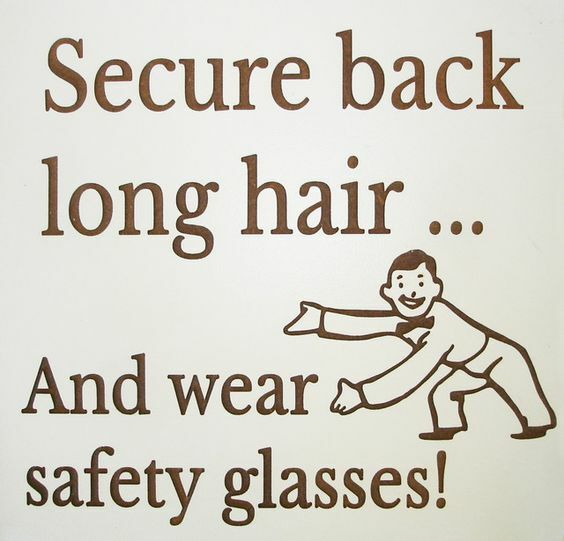 I added the glasses to the vintage advertising graphics using photo shop. 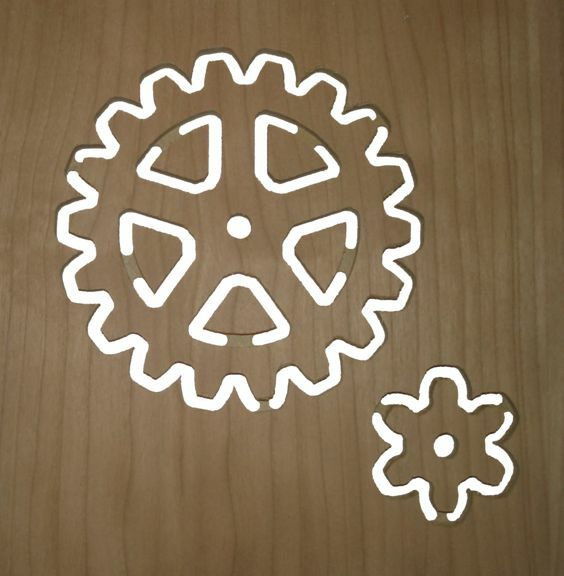 Skip forward to the next X-Carve post "Making gears". I've gotten bad about keeping the camera handy lately and I'm missing a lot of important photo opportunities. For example, we had two marble machines go out just last week. Two 8th graders made terrific marble machines and they weren't shy about showing them off around school. Our very popular math teacher had to come by the shop to tell me about it and how cool it was to have them showing in her classes. 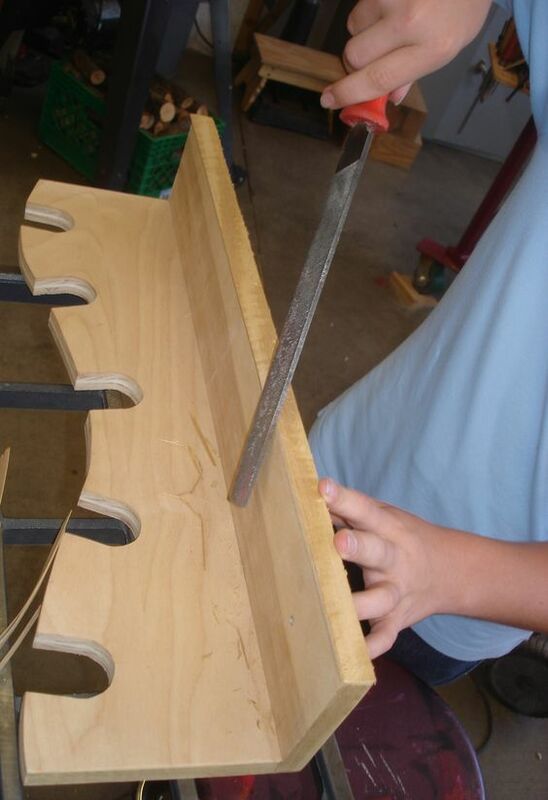 I happen to catch this 7th grader working on installing his hinges to a finger joint box he made to hold cd's. He is one of my 2nd generation students as I also had his dad in high school wood shop. Fast forward to his next project. Fast forward to see his 8th grade project. It has been over a year now. Rough starts, continual software upgrades, and even a new Windows 10 computer, and we are just beginning to run smoothly. That's not to say having a little more experience hasn't also played a huge part in what appears as our "new found" success. The Easel software is continually being upgraded and has an app section with a variety of different things to try. I watched a short video about the gear app and proceeded to experiment with using it. It turns out to be way easy. Here is what I was able to produce within an hour. Actually, each pair of gears only took 5 minute to cut, but the whole experiment from start to finish took longer. After all, I had to play around with the app a little in order to figure it out. 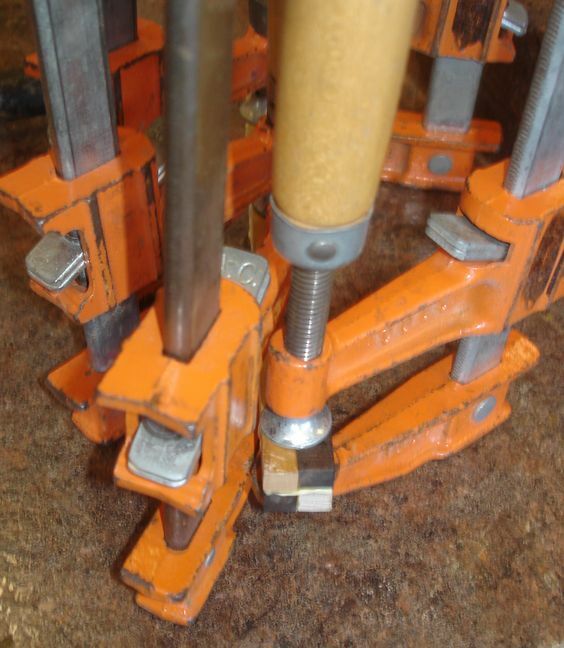 I also had to modify my holding jig so the 1/8" up cut bit wouldn't pick the project up. Any guess how I figured that one out. I also had to make the crank handle on the lathe and mount the gears. Although it was a bit hard to turn at first, I knew leaving it out during my last few classes would soon loosen them up. Still, I have more I can mount to make a longer string of them. 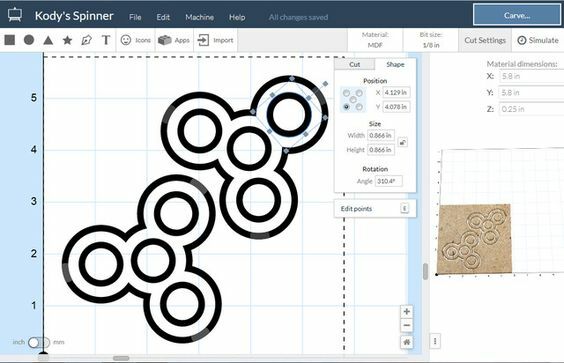 The Inventables staff has done a nice job coming up with some pretty neat gear projects, like dinosaurs that move their legs, or what looks like a robots claw and also a Spirograph. Kind of reminds me of being a kid again. 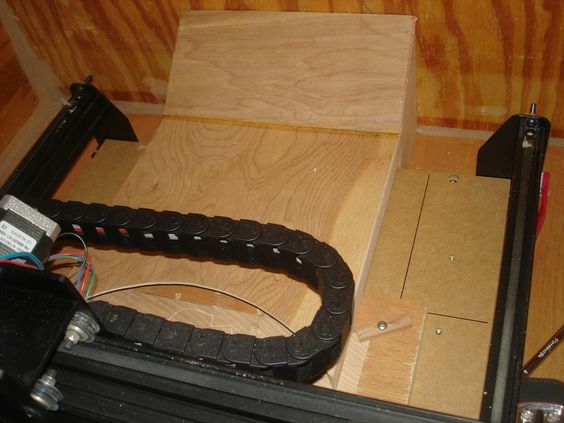 This image is linked directly from Inventables. 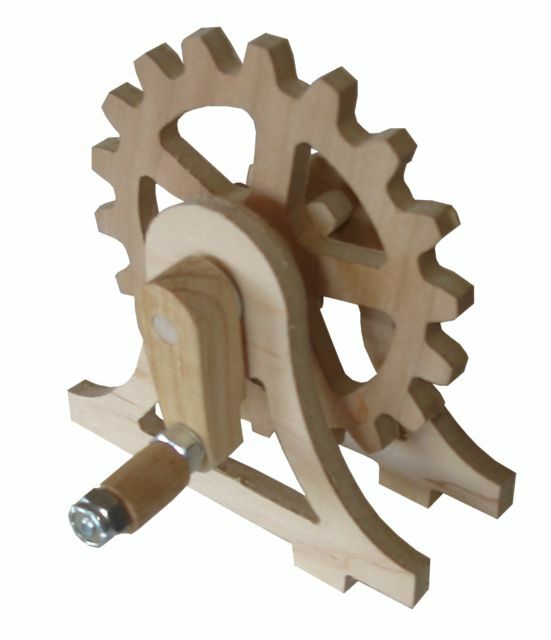 This might be something that my 8th graders might want to try, but until I try one first, I won't be able to access how difficult they actually are for a kid to make... not the gears, but all the additional parts that can go into making their projects. While I'm on the topic of using the X-Carve, I'd like to say that a tooth brush run over the tracks between projects goes a long way toward keeping the machine disruptions to a minimum. I'll go one step further and say that since we discovered this, the machine hasn't strayed a single time. I guess the only snags we encounter lately are operator error... choosing overly ornate images... not choosing the nodes image to save... not choosing "Plain SVG... not remembering to save SVG files in the SVG folder... not being able to find an image because you can't remember the file name... not setting depth correctly... not keeping projects within boundaries... walking away with the brush... forgetting to set home... and even those things don't happen very often... except to the less experienced. Other than that all is well so far. Even many forth graders can out carve some eighth graders... as I was showing and telling the school founders this week. Hey...... A new game show idea. Can you out carve a forth grader? Time to start really putting this machine to the test. 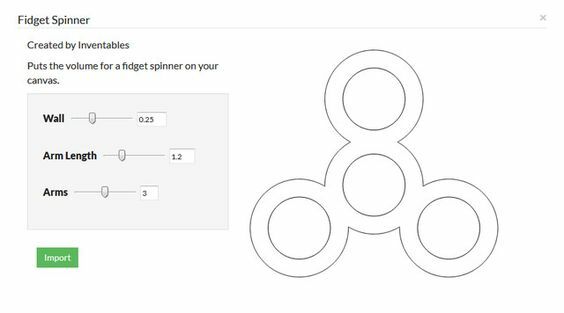 Skip up to the next X-Carve post on Fidget Spinners and The DeVinci Ornithopter. 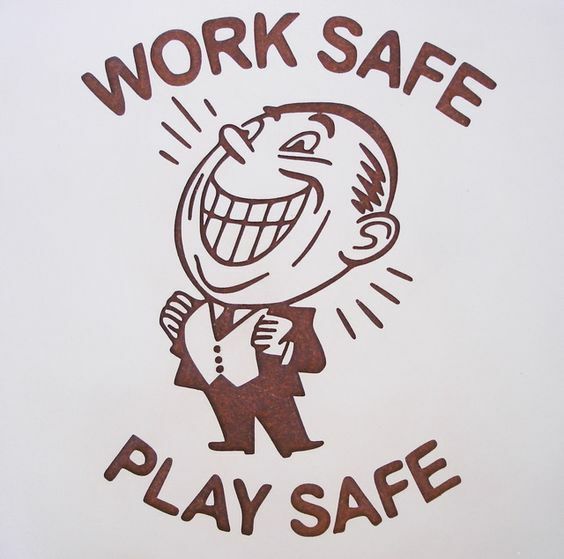 Skip back to the last X-Carve post "making safety signs". Horsing around, monkey business, meow! The 7th grader just a panel or two above this one... has been one of the more productive students I've had in a while. That is saying quite a lot about him since most of my students could qualify for that spot, however, in his case... he not only made several great projects including his own version of a neat looking trebuchet, (wish I had taken a picture of it) but he asked me if he could next make a cat. I'm thinking... OK! Odd request.... but let's give it a go. 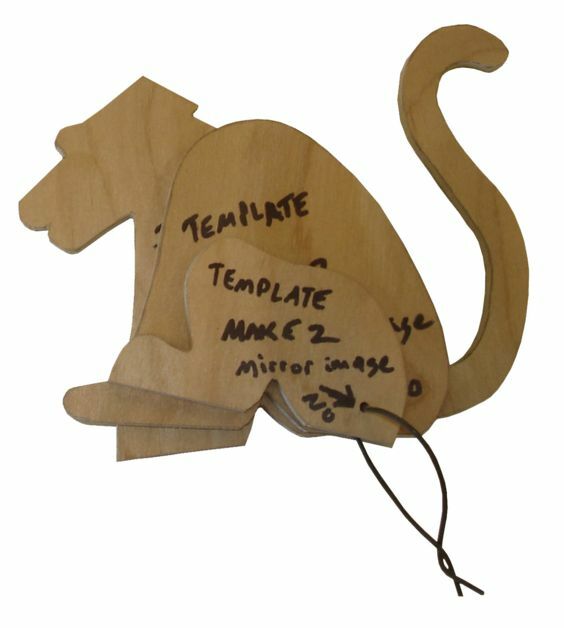 He and I worked together to make the cat and he also made a template too, but it wasn't the best looking cat (my fault) and although I've since had a few other students also want to make it from the template, it's still not one of my favorite projects. It's spring break now and he will be moving on to a different class, but I think I'm going to go back and try the cat again. However, I'm getting ahead of myself. He then asked if we could now work on a Seahorse. Wow.... where did that come from? I told him this time he should go look up what they look like and download a line drawing, if he can find one that he would like to duplicate. When he comes back from the office printer, we break his line drawing down into layers. I'm thinking this should be better than the cat. 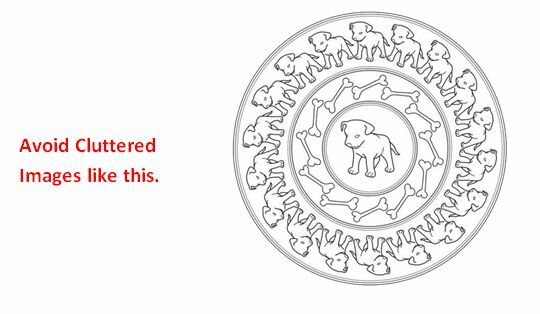 I also change my strategy and make every single layer, so students will make mirror image pieces without always being told. It's not that I mind telling them, it's just that they sometimes still make everything from the same direction and aren't able to hide the (sometimes) "chipped veneer" from their cuts. Mirror image will hide that on the inside. Now with the seahorse I never had enough time to make a sample, but already students (mostly 4th graders) have been making them. I could easily see these on some ocean themed Christmas tree, but for any other reason, I'm not sure I have a clue. That's OK because it's all a learning experience for the students and I think it's way cool when they get involved in making something new... and then also help make templates so others might follow. This has happened a few times since I've been here and it's always worked out well all around. As I'm expressing this during class, one of the students says it would make a great idea for bookends. I will admit, that is a great idea and I probably wouldn't have thought of it on my own. Everyone likes something different and a set of seahorse bookends will sound like a pretty good idea to someone. Bookends also wouldn't require making both sides, unless you make two. Then it would be two mirror image bodies with the tail, two mirror image shoulders and two mirror image legs. Then he hits me one more time. Can we make a monkey? OK... let's follow the same process. I'm a little busy so I leave it all up to him. He chooses the line drawing, and uses a 3/4" for the body with 1/4" secondary color overlays of another species. Hey, it looks pretty darned good to me, but he's running out of time. 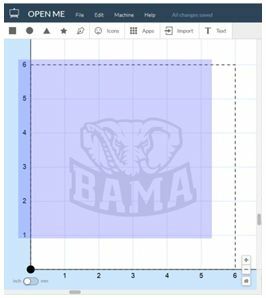 Two days until spring break and no time left for making the template. I told him, that's OK, I'd work on the template when I had time. I break it down into layers and come up with this... and with the same mirror idea in mind too. It makes perfect sense. I show him the templates which are a little different from his prototype... and he decides that it looks good and he's excited on that final day to make one just like it. He even traces a set for me to cut a class prototype. Now I'm running out of 1/2" and 3/4" material and it doesn't show up often as cabinet shop scraps. Since 1/4" seems the easiest to get, I've taken to layering 1/4" for a lot of projects. I am a former teacher who now sells machinery to schools and cabinet shops and I would like to share on your site that we are giving a discount to schools on Ritter machines. Can I get a log in for the site? 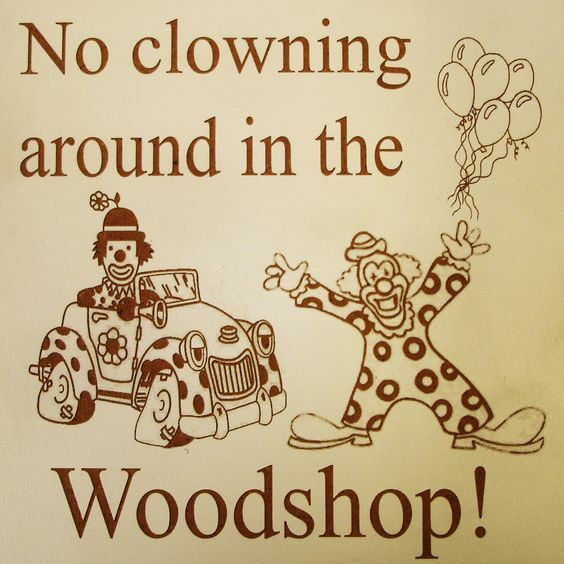 Check in with the site host which is Woodcraft. 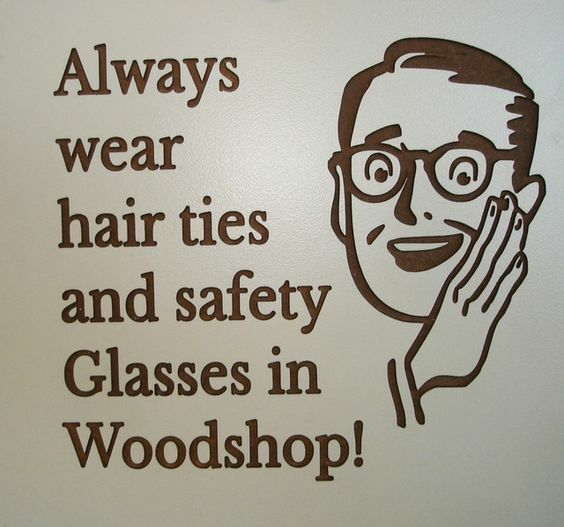 https://www.woodcraft.com/ But.... I'm betting they wouldn't give you a login simply because this is a non-profit teacher sharing site. It was closed because of robot spammers I'm sure. The best I can do is to somehow figure out a way to mention you or your company on my next post. A lot of sales people will offer a discount to teachers, so is there something else that would set you apart.... some kind of appeal or related to being frugal that warrants a casual mention, or even a hard focus in one of my posts? Go back and look through my pages if you would like to pitch an idea. It's not something I normally do, but it's worth trying.... however, I'm not sure (I could be totally wrong about this) that it would provide you with the traffic you would want or expect. Who knows what it might bring. Stranger things have happened. To be totally honest, this site has seen better days and since the recession, teachers have lost their budgets, and even their entire program or job, or have been forced to retire early. That's what happened to me and then a little Charter school hired me to do a lot with nothing (hardly any monetary backing) and the challenge (which I thrive on) turned out to be a great opportunity. Too bad hardly anyone else posts these days. I wouldn't even begin to try to explain how quickly it has dropped off this year. 3/4 of the school year has passed and only five posts besides mine. Five posts used to be a daily average. Now it has taken eight months to generate five posts, not taking into account the continuation of my posts... making it six posts total in eight months. It's pathetic that this life (being a shop teacher) is slowly dying. No one will know how to make things in a few more years. I understand. Thanks for your response Tom. We have a large % of the machines in the schools currently and we sell to them regularly so I am just trying to find the best avenues to get people the information. Site traffic isn't really the goal. I just want to make sure people know that our offer exists. It is my hope that skilled trades education will see a swing back towards where it was in the past and we are seeing that happen here so hopefully it will spread so our country can build and grow as it needs to. Looks great, your students are doing a wonderful job. I wanted to thank you for the materials you sent me this year, you have been a life saver. I really appreciate you being so helpful and willing to share your plans. Since this is the first year having a yearlong class (3 of them) in middle school I didn't know what to expect. Your powerpoints are phenomenal. We use them once a week, we call them "Powerpoint Wednesdays" it gives the students a chance to see how the products they use everyday in class or at home are made. The students will take notes or write down the vocabulary at the end. The embedded videos are terrific, they help keep the student's attention. Thanks again, have a great rest of the year! Hey John, I'm always glad to help. I have to share all I can before the end.... which as it turns out may be sooner rather than later. Long story with more health upsets as of late. Still.... I'm hoping to keep going into next year and beyond if I can possibly do it. No pacemaker or blood thinner is going to stop me.... hopefully. I should be back to school by May 15. I'll have to wear an arm limiter to keep from lifting my arm and possibly pulling out the wires that are going to my heart. I feel like I'm falling apart lately! And all the rough meds I've been through in such a short time are taking their toll. ***UPDATE*** 5-29-17 I had the pacemaker in 4 weeks now, made it past the motion sickness sometimes caused from blood thinners, been cleared to drive again, finished out the school year, and have recently been in contact with Joshua Lawson of http://www.shopclasskids.com/ where I may be working on articles and sharing curriculum. 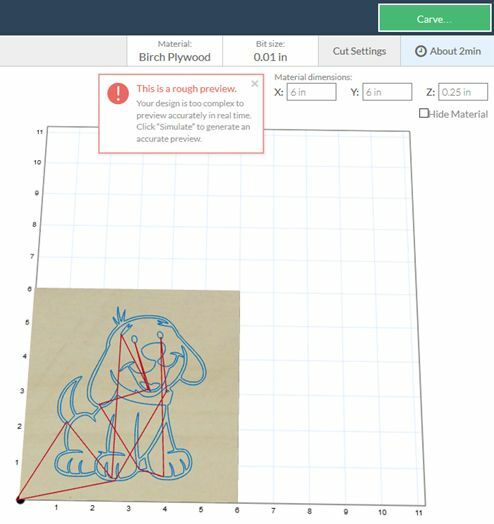 I was going to go in another X-Carve direction (which I haven't given up on just yet) when this came up. Actually, we've perfected something that is fast becoming popular. I've heard of them.... and I've even seen them, but now X-Carve is helping us create them in class and they have become all the rage around our school. 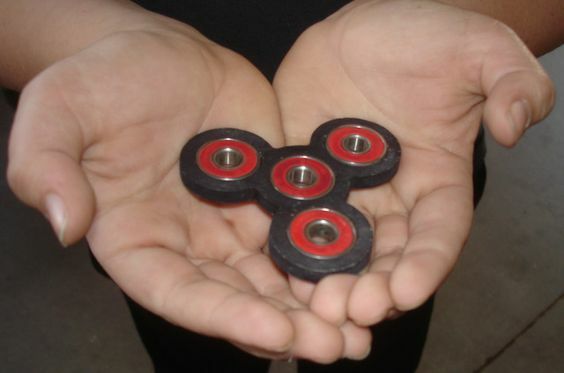 Fidget Spinners! Sometimes I watch the X-Carve videos and sometimes I don't. In this case I didn't. And yes, it is really that intuitive. The X-Carve is turning out to be just what I had hoped it could become.... A multi use machine that can even be controlled by a 4th grader. It's fun, and it is slowly transforming what we can do in the shop. 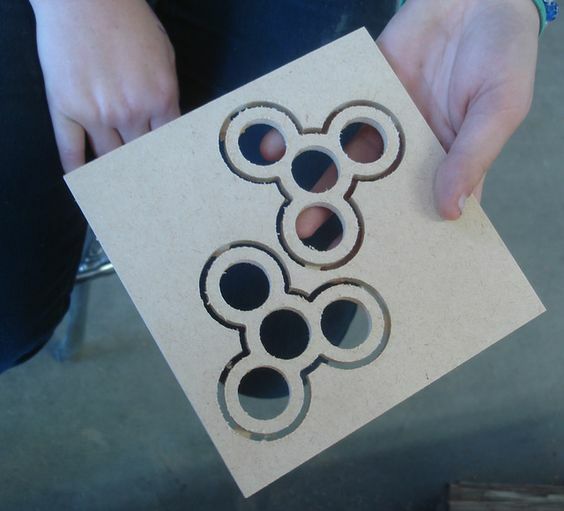 This success story begins with a 6" square of 1/4" scrap MDF from the cabinet shop dumpster that is being fashioned into two fidget spinners blanks. 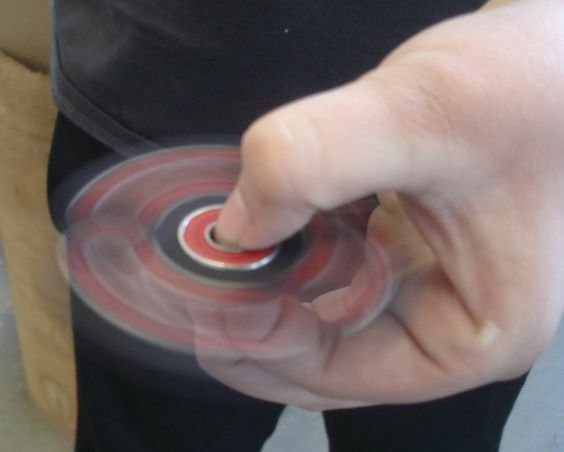 A sixth grader used a sharpie to make his spinner look like the store bought variety we've seen around school. Add a few nifty used skate bearings (which get pressed into place) and you have an absolutely free and good looking spinner. Red skate bearings were also a nice touch Champ. Only $5 on Amazon... or so I've heard from Micheal. The action toy that is sweeping our school (and maybe yours too) is keeping kids interested in the waning days... after all the weeks of mind numbing standardized tests and not many weeks left of school... here anyway! I haven't heard anything negative from the other teachers, so the kids must not be distracting everyone during classes. As for the two boys who got this all started, theirs didn't work out too well. Their design called for thinner walls that wouldn't hold up to installing the bearings. Not to worry though, because they have taken on a whole different project now. ***UPDATE*** 9-14-17 We have been running this machine non-stop for a long while now with little issues here and there, but nothing we can't figure out. After cutting gears and cutting spinners, I am finding out the limits to how long a bit will take it before it breaks. The down cut spirals seem to be the worst as they will eventually snap even after slowing down feed rates and depth of cut, they still eventually develop metal fatigue and give up. I've also noticed how quickly the fine dust can begin to build up on the machine rails, especially during gear and spinner cutouts. The exhaust system doesn't seem to be able to keep up sometimes as the router flings the chips and dust mostly to the left side. I can't afford to purchase the nifty dust brush and hose that is available for this machine, so I decided to try making a dust system extender to get the vacuum closer to where the cutting actually is taking place. Here are two that I have come up with that seem to be working well. Instead of a plain old hole at the back of the cabinet, the extender brings the suction right up to the work area. They cover the exhaust port and sit directly on the bottom of the box and telegraph out towards the cutting area and onto the back of the cutting surface using their own weight as an anchor. No magnets or screw hold downs, so it is easy to put in place or remove. So far they are working extremely well on normal projects. I don't see much dust build up in the box or on the rails. 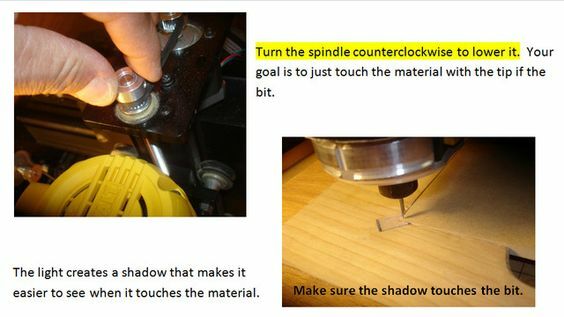 I have yet to make a spinner cutout that really will test what it can do since that is when the most dust happens using larger bits cutting completely through the material. The biggest problem will be when I use a larger project size. With the way we are using it right now, that isn't often, but if I were using a larger project size a lot, I would have to make another shorter version to allow the X-Carve space to move into that larger area. Their current length might also become a problem if the machine suddenly veers off path or a student accidentally changes the project size but still uses the same smaller project blank. The vacuum barely fits under the machine and the chuck could come close enough to hit the extender. I'm not sure what would happen next... a broken belt perhaps. I may want to make another extender using cardboard that can give under the pressure of a mishap. After having nearly 2 1/2 completely unplanned weeks off from school to have a pacemaker put into my chest, I expected to come back to this project and have it ready for a cork lining so we could test glue a veneer set. Everything I was told or that I read about concerning this procedure (the pacemaker not the cork), it should have been easier, like getting an "In and Out burger". You are right... it is a little more serious than that and I found that out by living it. So back to the skateboard project. No, they didn't get much done in my absence and to make things worse, there only a week left of school. Better get crackin. While we have done many skateboards/long boards, they have all been flat and a little lifeless. It's not that the students don't love making these type of skateboards, its just that they are simple cut out shapes that anyone can do. How about contoured sleek street boards. 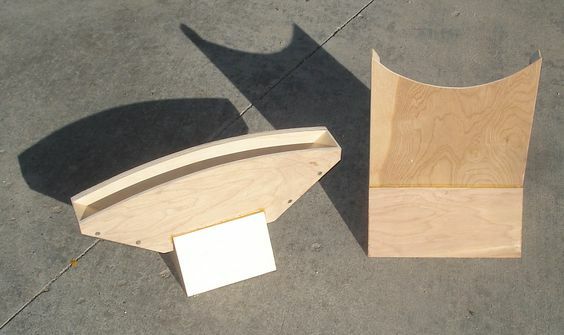 That takes making your own forming molds and buying Canadian maple veneers. 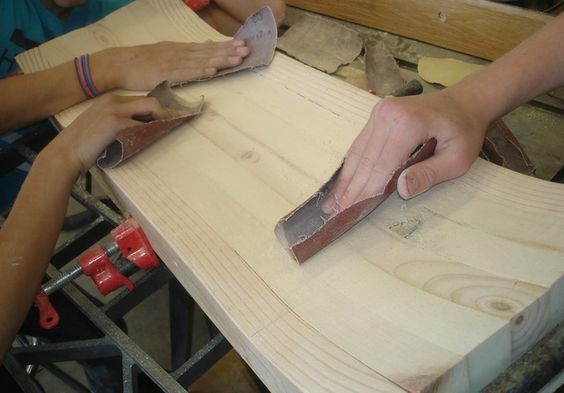 That's what these kids have been up to... making a forming mold for a skateboard as found at www.DIYskate.com. ***UPDATE*** 8-10-17 We are in the middle of our first week of school. Although the veneer quality was evident, it turns out that DYI Skate is too expensive for the average kid. Each kit cost a minimum $20 just for shipping and the kit was almost $40. I casually asked one of my 8th period classes... How many of you would be interested in doing a custom skateboard if I can get the total price down to $20? I was a little surprised to see 7 or 8 hands immediately go up. So I started doing a little on-line research and found a much more economical website, especially if I can get a group of 15 to go together at one time. Dub Press Distribution has a package..... that after shipping... only comes to about $18.50 per student. I started a list and if 15 students will sign up, bring in their share of the cost, then the school will make the purchase. This morning I got onto the site to double check the numbers and the estimator for UPS ground total was again $75.92 making the per student cost about $18.40 each. I'll probably ask for an even $20 and then refund the difference after it arrives. Hopefully it doesn't change. I'll keep you posted. 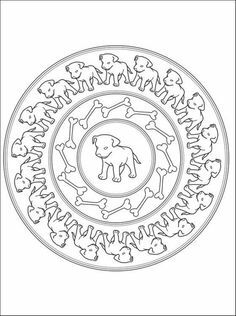 After tracing and cutting each piece of the form, the differences have to be chiseled or cut away to make them somewhat even. Then a good sanding to make them somewhat smooth while removing ripples between pieces. Once both halves of the form look ready, a layer of 1/8" cork has been applied to further even them and take up any difference between the top half and the bottom half under clamping pressure. 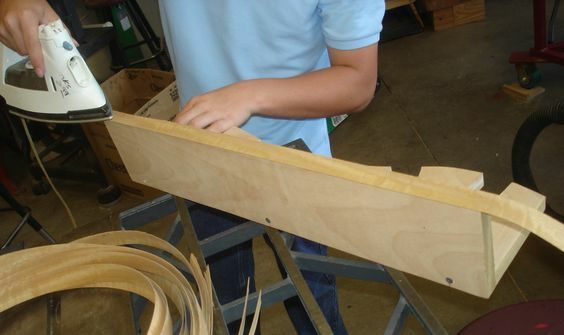 At my other school, we had a nice vacuum press and only needed to make the top half of the form to make our boards. The vacuum press worked better that way. Here we don't have that luxury. 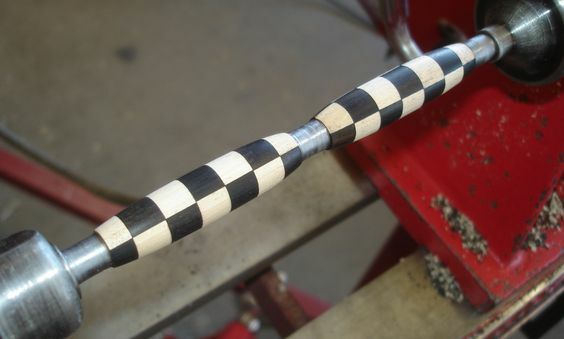 This practice piece is made from 3 layers of 1/8" door skin retrieved from Home Depot scraps. The shape looks good and we are ready to glue up our first board. 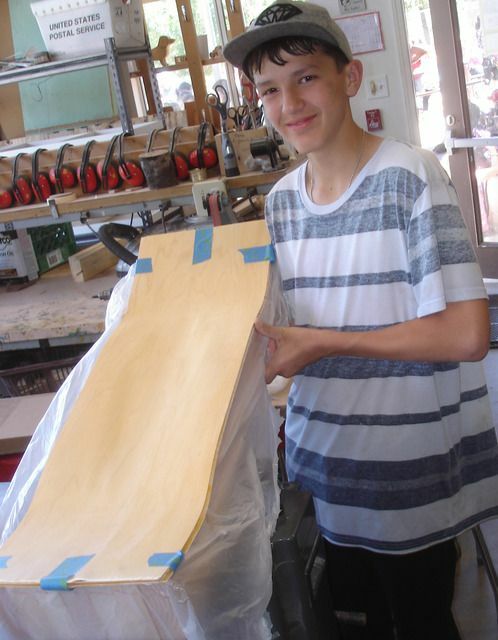 Here is our very first skateboard made by this graduating eighth grader. The only thing left is to cut it to shape, something he will have to do at home since school is now out. I hate to even admit that this skateboard project was the ONLY thing that motivated this student to work in wood shop... but motive it DID! 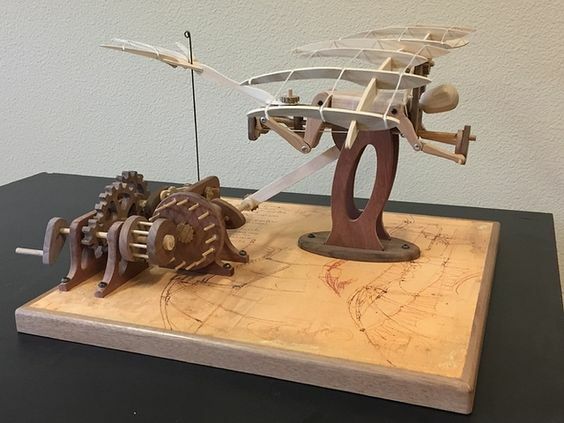 Dan Baker posted this with a video... and I would like to work through the parts and build so our students can make these from scrap. He offered his original drawings. Dan shared his thoughts about making the Ornithopter with a little slop in everything so it will move correctly, and we also discovered that Inkscape has a nasty way of reducing everything 20%. I had to figure out how to make them the right size. It turns out that that's not a real big issue. I could have left them 20% smaller, but then I'd have to lathe drill the 1/4" center holes to keep the gears running true so I ended up increasing the size of the image in Easel until the center hole was exactly 1/4". All the other parts had the same issue and I was glad Inkscape let me take one piece at a time so I could adjust everything before trial cuts were made. 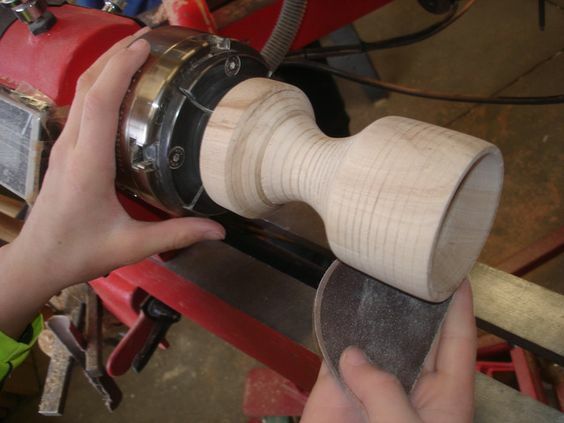 In this next piece, the left bearing needs 1/4" dowel hole to allow for the rotation. The cam next to it does not. I won't be able to tell if the barrel gears work until the bearings are mounted. I have to use what we have around the shop, so my dowels are a little larger. When I found these dowels on campus, I wasn't sure I'd ever find something to use them on, so here's hoping they work for these type gears. Here is the main gear in a test position. It has the smaller one right next to it and will be run by a small gear too. This isn't exactly the way it actually goes together, but is only a test fitting to see if these sizes work and the holes are correct and centered. Everything seems to be working fine so far. The only change made here is that I added bottom tabs for mounting the bearings to a base. Who knows.... maybe I should remake everything 20% smaller and try lathe drilling the holes. It might make a better product. As it is, I've been squeezing the work in whenever I can and that's not often during testing or when I have to be out for health reasons. Honestly, I don't know why this school puts up with me. If I'm not trying to persuade them to get me a $7500 laser engraver, or working to squeeze in projects like this, or writing grants for an exhaust system, I'm out for health reasons. I was never absent before and now I'm going over my limit for the year. I think that I'm becoming a real burden. Let's keep hoping they don't really feel that same way. As always, I'll keep you posted on the progress and these will certainly (eventually) be split off into their own posts. I think next years students might want to build a few once the templates are done. Wow.... its hard to believe that it has almost been 4 years since the first post on this thread. I found your email address on the woodworkingteachers.com website. I applied to be allowed to register on the forum but was told since I am not a woodworking teacher that I am not allowed to post questions. I'm reaching out to you in hopes that you could direct me to some shop class curriculum and perhaps sample lesson plans. 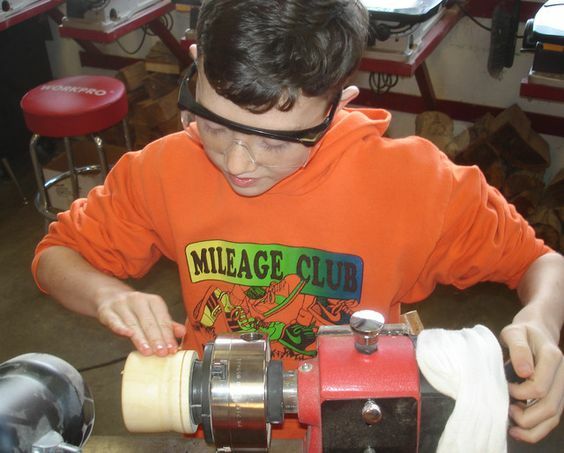 I have 3 boys (age 13 and under) and as I see shop class disappearing from schools nationwide the past few decades I figured I would find some curriculum online to teach my boys. I'm reasonably handy at DIY and can teach them about tools and simple construction techniques but I was hoping there would be a lot of useful information online. Unfortunately I have not found a single shop class book or manual written after the 1960s. There are a few good documents available (from 4-H) and I have seen a few youtube channels but not much more than that. So I've started a website devoted to sharing information that is or should be taught in shop class for the younger generation. This would include middle and high schoolers, as well as many millennial's who are now adults and don't have the basic skills many of us were taught in the past. The website is www.shopclasskids.com. There is not much content yet but I've received excellent feedback so far so I'm hoping you can help me. Do you have any lesson plans or resources you could point me to so I can provide some ideas, tips, safety practices and anything else for people to utilize? 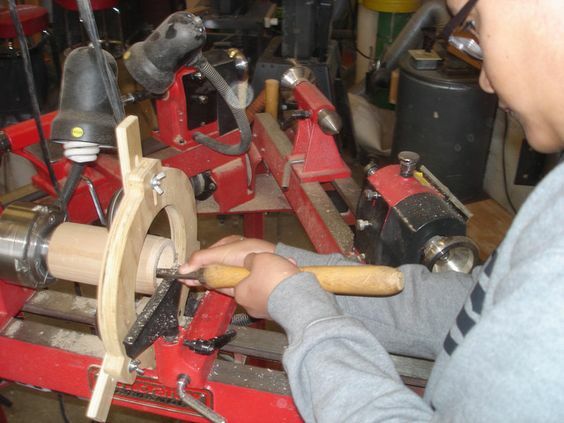 While I am not a paid wood shop teacher, we do home school our boys so I am a teacher in that regard but since I'm not allowed to post I am just trying to find someone that is able to show me some resources. Now I'm not getting any younger! I decided I had better try to share what I can in a format that can help as many people as I can possibly help, before it gets completely lost as my final retirement gets closer and closer. While I have signed another contract for the coming school year, I can tell there aren't too many years left in me and in a year or two I'll be surprised if I'm still at it. I have made contact with Joshua and find him most pleasant to work with. I told him about the curriculum project we started back when many of us old timers were still posting on this site. It was something I had a passion to create and everyone who pitched in to share made a huge difference in how it came out. I believe that all participants in that project benefited greatly and the material was cutting edge for it's day. 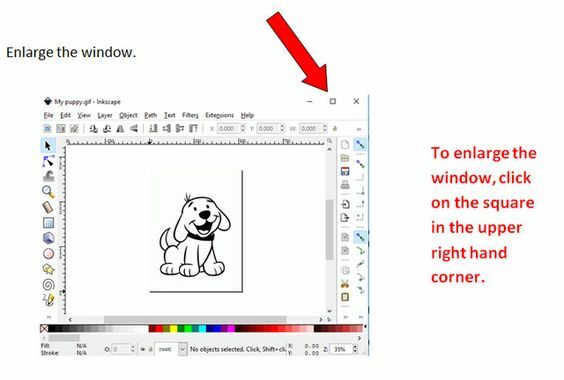 After seeing a few things Joshua has been able to do with converting PowerPoint to youtube, I shared a few documents over Google docs. I'm not completely satisfied with how Google docs filtered and seem to change the appearance as it got to the other end, so I made sure to send everything on a Flash drive. That should be arriving any day now and I look forward to hearing from Joshua again soon and to hear what he is able to do with it into the future. I think that whatever we can share with Joshua will take our (curriculum group) goals one step higher. 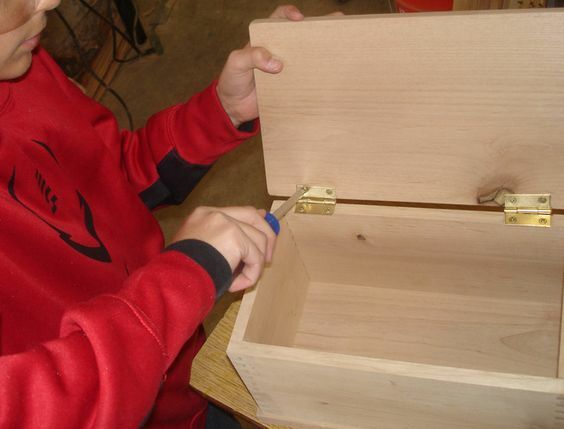 I remember proposing something similar to shopclasskids.com and not getting enough participants to share in the article writing for it to get beyond mere suggestions, but then Joe Novack and I worked on woodshopteachers.org which has since disappeared when Joe retired. He was a driving force behind getting it to the Internet! I think that from the homeschool parents perspective, to be able to continue access to this curriculum is going many leaps beyond what I ever imagined we would be able to do. To have it open source for anyone takes it well past what I ever could or would have done on my own. 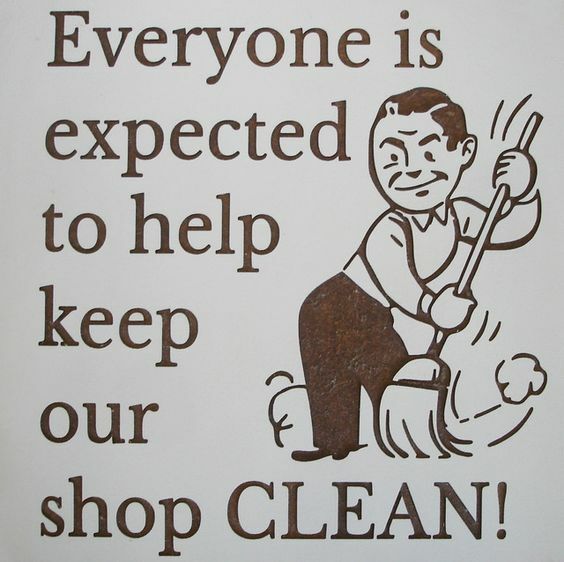 For that, I thank shopclasskids.com. My name is Joshua Lawson and I run the website shopclasskids.com This is a place for kids (young and old) to learn the basics of working with their hands. My wife and I homeschool our boys and while I can teach them about various tools and basic things like how to change a tire I do not have the knowledge necessary to teach them solid woodworking skills as well as the fundamentals of welding, automotive, electrical and CNC technologies. There are plenty of videos on YouTube but many of them are geared towards more experienced people. 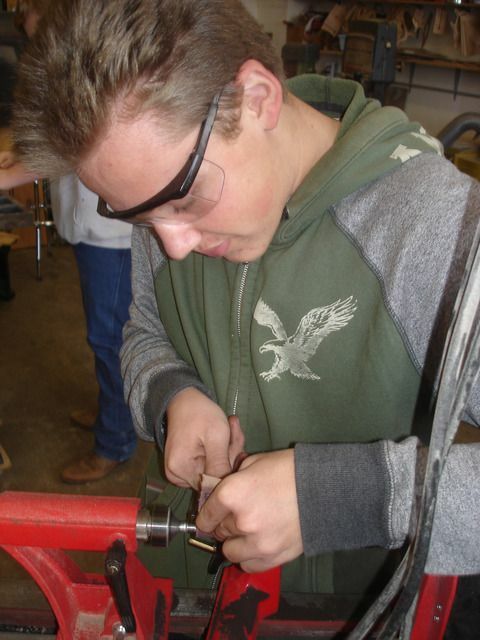 I also realized that shop classes have been disappearing from schools the past few decades. After a lot of searching online and coming up empty I decided to start my own website dedicated to teaching these skills to not only my boys but any children out there who missed out on shop class. The target audience is not really the middle school and high schoolers but their parents, many of whom don't have the ability to teach things that they themselves missed out on. The site is family friendly and my hope is that the children who do come onto the site will find the information useful and hopefully start building projects that we can feature. The plan is to not only have curriculum that homeschoolers and self-directed learners can use but also to show simple and eventually more advanced projects that people can build. We also want to ensure that everyone has a basic DIY skillset and general handyman skills. Technology is a wonderful thing and many things can be manufactured out of plastic cheaply but I feel it is still important to be able to have basic repair skills and the ability to create something from a few pieces of wood or metal. 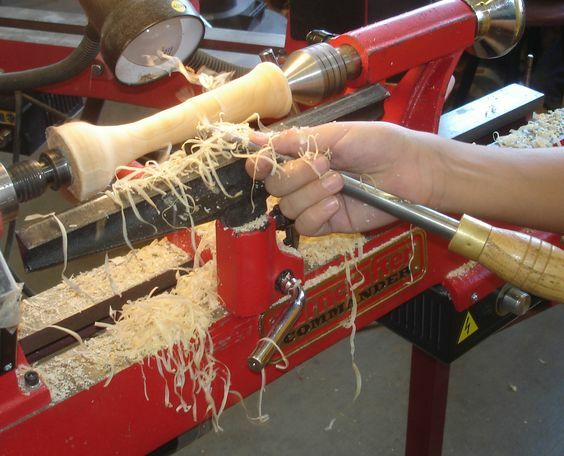 There seem to be more and more people each year that lack these basic skills and if they were knowledgable about the things one learns in shop class then maybe there would be more folks interested in doing more than just the basics. I am seeking help and advice from experts (preferably instructors) in the aforementioned technologies so if there is anything you can share, please contact me. Even if you don't have the time to contribute articles or share lesson plans, maybe your students would like to see pictures of their creations online. I would greatly appreciate any help you can provide. Without warning, Photobucket changed their policy and now requires you to pay to have 3rd party links! This Photobucket error message suddenly appeared shutting down all the photo links, so I'm in the process of a "work around" remaking the links to as many photos as I can retrieve from Pinterest. My hope is to complete this task in a few weeks before school starts. There will be some loss as not every photo was posted to Pinterest, AND... photos from Pinterest do not have the attributes that allows for transparent backgrounds, so some photos will now be in a white frame. UPDATE 3-4-18... I recently found that DivShare has also re-assigned my addresses to a paying customer no doubt, so all the links that go to DivShare do not show what they were suppose to show which was project plans and videos. They used to work great... and then.... all that effort down the drain as I got caught in the DivSnare. Yep, they held my information hostage because I didn't want to convert to a paid subscription. So much for using free services like Photobuckrap or DivSnare. Done... with making the new photo links that is! Just in time to start back tomorrow. It's hard to believe we are already getting ready to begin another year. Students come back to school in a week. As for the photos.... I did my best to get every one of them. All have been filtered through Pinterest which by the way, isn't as difficult as it might seem. Especially if you upload your photos to Pinterest in the first place. This means you can skip all the photo sharing sites altogether. To get your Pinterest photos to show on this site, find the photo in Pinterest, right click on it and choose "view image"... then copy the web address. When posting on this site, paste that web address into your post... then highlight it... then choose and click on the icon that looks like a photo (has the mountains and sun) and this site will add the proper HTML code that lets you view the image when you complete the post. I go one step further and choose center so it comes out in the middle. The biggest loss with using Pinterest will be the ability to clip photos and make transparent back grounds. Those really did look cool. If I ever get ambitious and find I just can't live without transparent back grounds, I'll search for an alternative to photobucket and remake just those links. 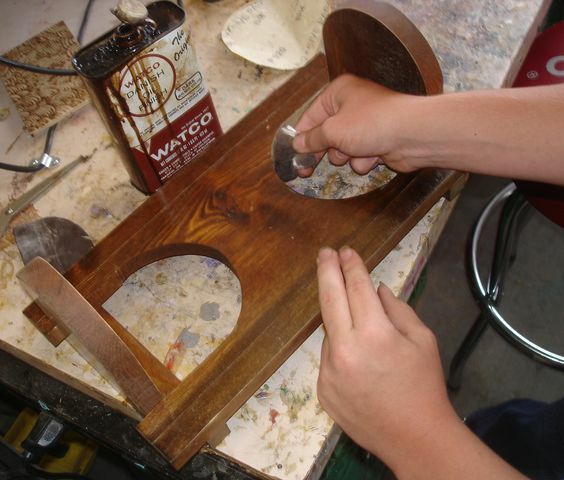 Made in a shop class when one of the dads was in school, the 7th grade son... Scott... brought it from home and is getting ready to replicate this folding book stand using a single door off an old water bed pedestal. 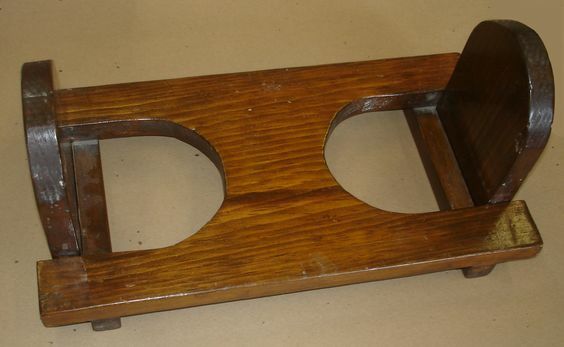 I had a water bed frame and pedestal given to us and we used the upper frame part for making the skate form. I know this is an oldie but it's also one I've never seen before. It holds only a few books, but it could be just the right size for most kids, and it folds down to be flat for storage. I thought it would be a good idea to make this template so other students could also replicate this project. Now I have to figure out where the solid pine will come from once the water bed doors are gone. I'll keep you posted on how this pans out as Scott figures out the dowel hinge system. 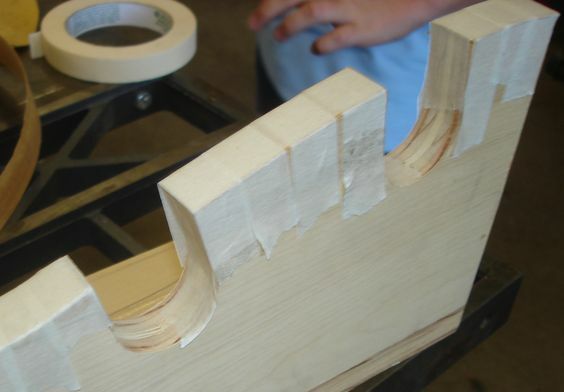 Each long edge has 3/4" trimmed from it which later gets added back. This will be where the dowel hinge is located. The template you see already has the long edges removed. Amazing... on 8-25-17 this thread went over the 200,000 mark... most ever for this site! ***UPDATE*** 8-27-17 With several hundred hits a day, I know I have to keep my promises and show you the progress Scott is making. I have to apologize as I completely forgot to start taking the photos where Scott is tracing the template and cutting out the base and drilling the dowel hinge. Here the dowels have already been installed. 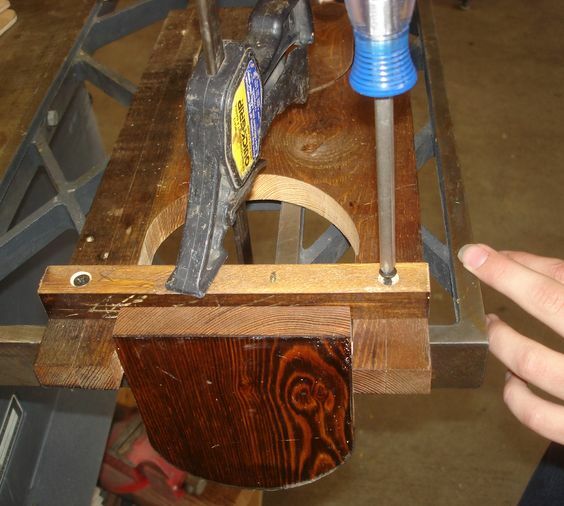 The hinge works perfectly and it is ready for the outside pieces to be put back on. After the outer sides have been glued back into place, the cleat screw holes are drilled. You can see the leftover hinge holes from the when this was a door on the waterbed. The cleat is being installed. The edges are being touched up. It looks just as good as dear old dad's! It also appears this is going to be a great start to a new school year as the students seem more motivated to try new projects. I on the other hand am having a difficult time feeling as energetic or should I say as "mentally in the game" as I have in the past. It's something I can't quite put my finger on. Is it a medication change, or simply I'm running out of steam? Or possibly I have just reached a point where there is less new ideas to work towards in expanding our shop. Say it ain't so! I'm anxiously waiting for news about the grant which will really make a huge difference to this feeling as the shop could really use the financial boost. I was actually surprised we hadn't heard anything before school started. I wrote several things into the grant that I hope survive. A super dust collection system that would unhook us from all the small individual collectors around the room. 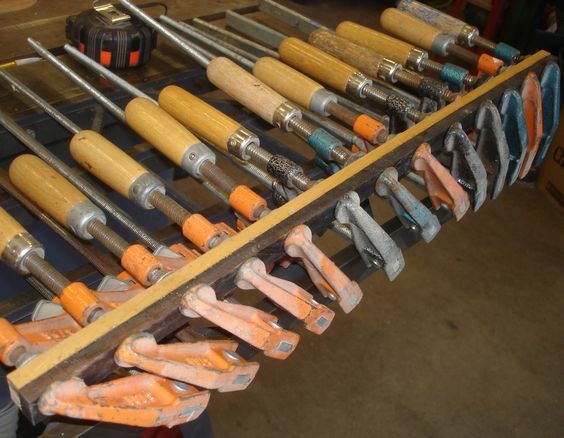 This would create more floor space and keep the shop cleaner. I also noted that we could use upgraded LED lighting and a laser engraver. Here's hoping the newly formed grant foundation that I have been encouraged to apply to can get their act together and give us some really good news soon. Go forward to Scott's next project. I've been staying quite busy and recently had the opportunity to bring in some fresh tree branches that a family donated to the school. 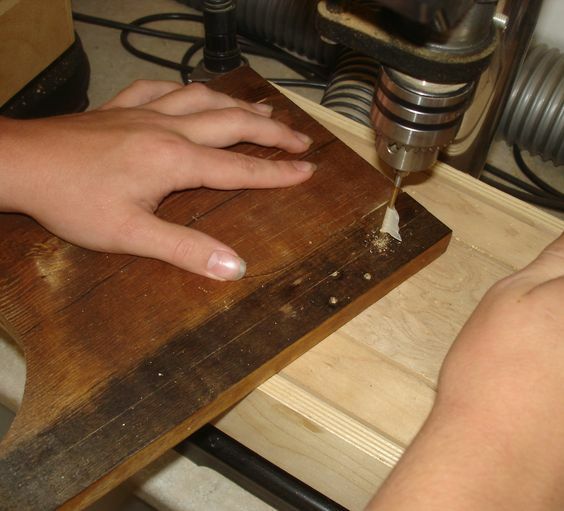 After cutting it into workable pieces and sealing the ends, I showed the students how easy it is to turn wet wood. This wood is a low grade (somewhat sappy and sticky on the bark) Juniper and it is perfect for letting students practice their lathe skills. Ribbons of wood literally were draped over everything in their path and even some went beyond as a few were cascading unto nearby machines, looking as if some obscure cook were throwing fettuccine noodles all around the wood shop. It even clung to shoes and was easily being tracked here, there and everywhere, reminding me of something straight out of "Cat in the Hat". Depending on which way they held the gouge, serious streams of straw colored confetti ribbons easily as long as four feet could fly off the spinning wood... much to the delight of everyone around. The kids said it reminded them of silly string.... as it was really teaching them the best ways to apply the lathe tools to the spinning surface... or at the very least, teaching new techniques that usually take much longer to develop. It was so much fun for them that it was hard to get them to stop and clean up at the end of class. The by-product of course were huge piles resembling grated mozzarella, to be cleaned up, which were actually easier to grab by the hand full... to put into a garbage bag for garden recycle... than to try to vacuum up. The less obvious by-product was of course the skills they slowly obtain by doing fun activities like this, which they will easily remember many years from now, even if you do have to sweep up the entire area afterwards. I know I have covered the pen making before, but... one of our office staff brought in a large block of ebony and a few other misc scraps, which was really nice because it is something we could never afford to buy. Seriously, the last time I saw ebony pen blanks, they were going for $8 each and these donated pieces were far larger than a pen blank. We have made more than a few pens with it, and found it to be hard and brittle but super nice looking, almost resembling black plastic. 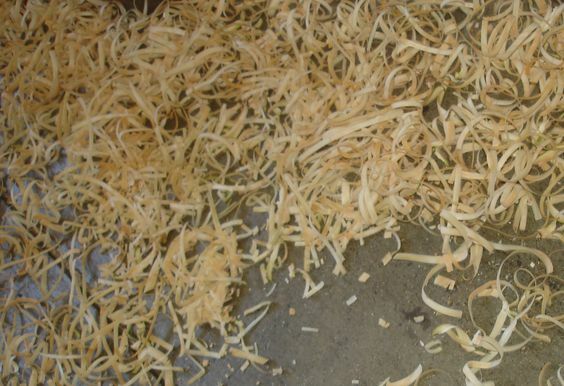 We wondered how we could put some of the thinner scraps to use when I decided to try mating it with maple. The contrast of light maple and dark ebony together looks simply fabulous and they easily glue together with Titebond II. 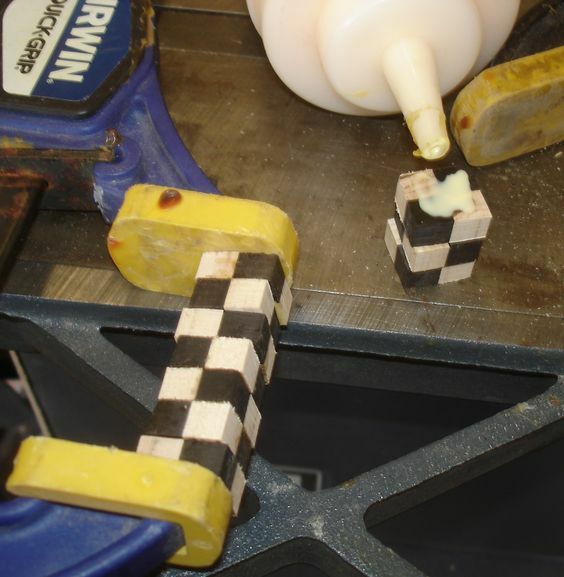 After the glue dries it gets cut down the middle and flipped so the light and dark begin having that distinctive checkered look. This gets glued back together... paying attention to lining up the seams so the checkers squares stay as aligned as possible. 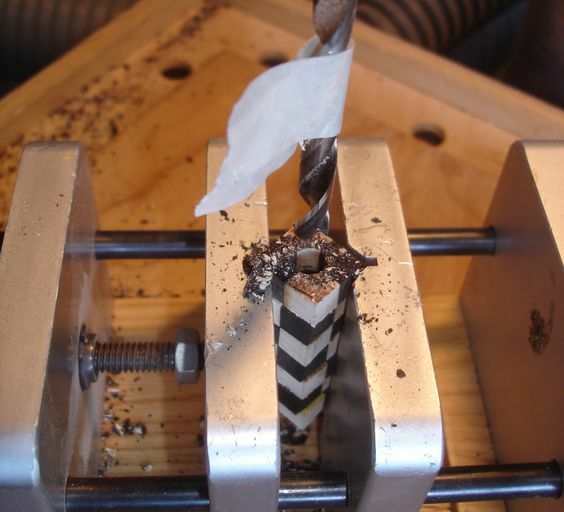 Each block gets turned 90 degrees and glued back together again in sets of seven, making each half of the pen blank. 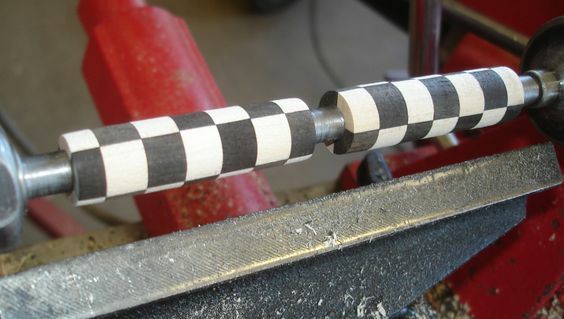 Now the pen blanks are drilled on center (from each end) meeting in the middle. The masking tape lets you know when you've reached halfway and to stop drilling. 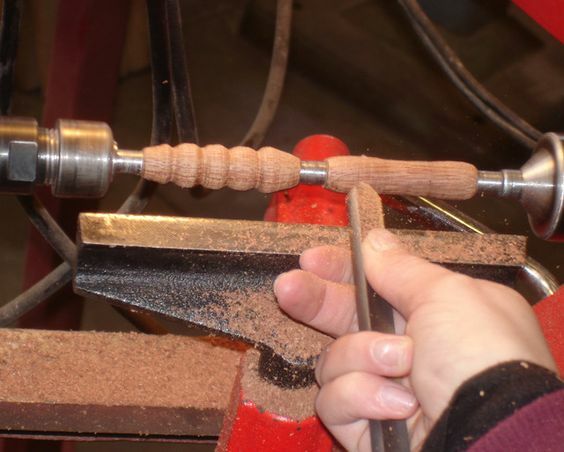 When drilling from each end, sometimes the holes are slightly out of alignment, but a quick run through with a round rasp usually makes the brass tube slide right into place. Gorilla glue will foam and fill any slight voids from this process. 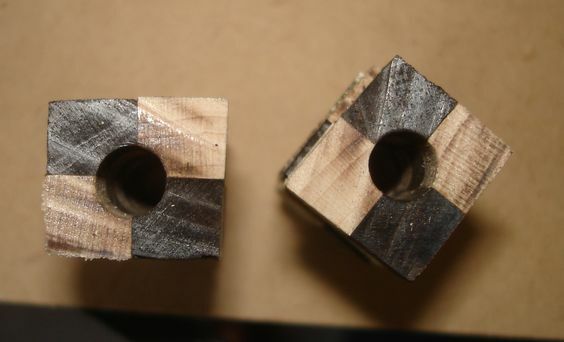 Drilling from each end keeps them truly on center... but it also keeps the end blocks from getting torn off as a drill exits. Some students have discovered this when they failed to follow the directions. 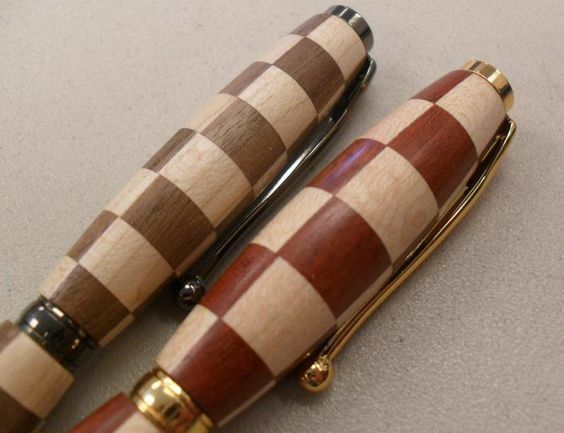 All this attention to detail keeps the checkers in alignment as can be seen when the pen blanks get rounded. After being shaped to their final contour, they are ready for sanding. 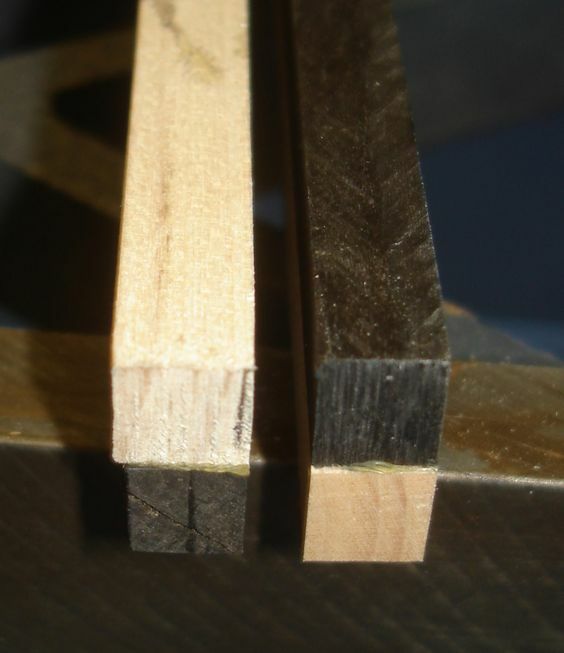 During sanding, ebony creates the blackest fine powder/dust that stains... or gets trapped in the grain of the lighter maple making it a little more difficult to work with. However, straight and true lines can be expected upon final assembly... at least as straight as you can manage when gluing up small pieces that want to slide around while you attempt to line up from more than one direction. The difficulty level of this project..? It's certainly a challenge to keep all these pieces lined up so it looks good at the end when the glue makes them slick and want to slide in every direction as you clamp. While not impossible, it isn't easy, but it is very rewarding when you succeed. 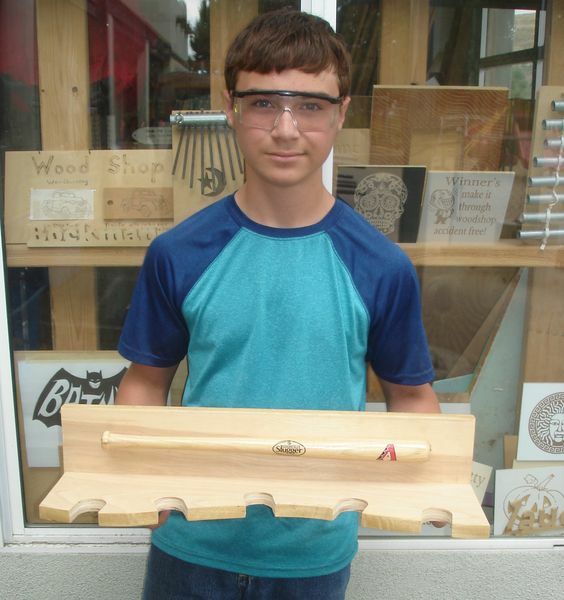 I mean that in the best way of course as 7th grader "Scott" is at it again, this time designing a baseball bat rack from scratch. It's hard to believe we are in our fifth week of school already. Scott is fantastic! The template... was the product of Scott taking home the digital caliper to measure each baseball bat so we could have the right space that any of his bats would fit. Tracing and cutting the sides... Scott decided he liked the already curved cut pieces he found when I sent him to the wood storage around back. I have found these students to be trustworthy enough to handle the keys and come immediately back with what dumpster dive scraps we save there. Assembling the rack... and installing the Arizona Diamondbacks miniature souvenir baseball bat which Scott purchased while at one of the games, makes it really stand out! This is much better than the idea that I first pitched of making a bat shaped back panel. The 3 dimensional aspect he thought of is what appeals to everyone who sees it. A couple of nails with the heads cut off, are bent 90 degrees and inserted into pre-drilled holes in each end of the miniature bat. 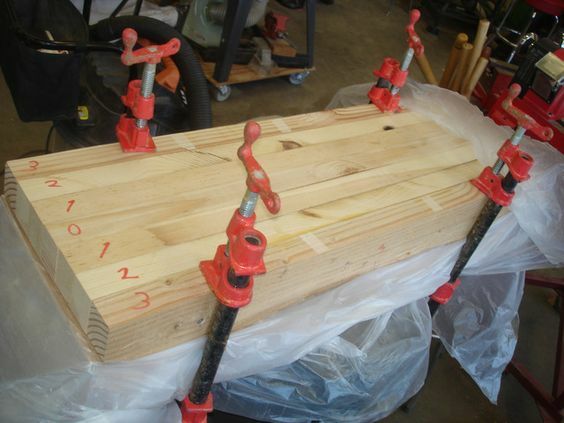 Pre-drilled holes also allow it to mount onto the back of the rack. If Scott ever wants to remove it, it isn't loose so it can't just fall off, but it can be pulled off with a little effort. That will leave only a small hole at each end of the bat. My bet is that he won't ever remove it and that he is going to cherish this project and eventually pass it down to his boys. Applying the edging... Scott has mastered the challenge of adding a fragile veneer facing to the plywood edges. This veneer edging was given to me several years before I came to Franklin. It is very dry and easy to damage which fits perfectly with our reused or recycled materials shop mentality. 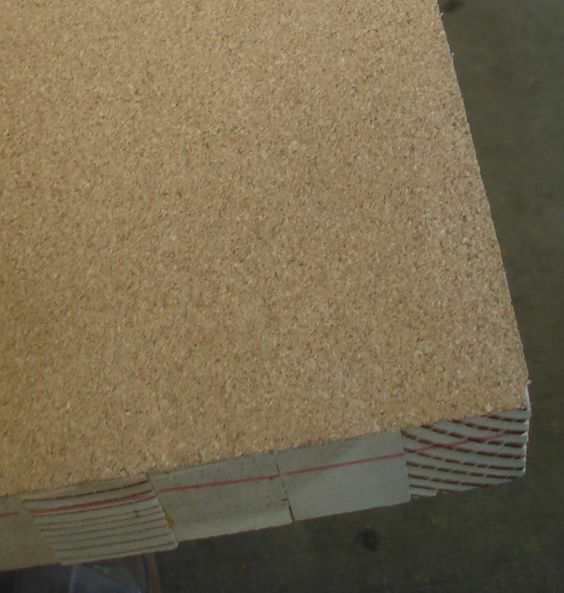 Using Titebond II, and letting it set a little on the plywood edge before applying the veneer, a hot iron is immediately pressed to it instantly bonding the veneer edging. We know it is instant because we had to remove one that was damaged while working with it. This doesn't work as well on curves, so masking tape to the rescue. Each gets trimmed with a file after the glue bond has set and dried. Sanding completes this process. It's a bit of a tedious process, but the final product looks fantastic. It will definitely be a show piece that everyone will Ooh & Aah over. Scott shows off his final product while standing in front of our display window with lots of cool projects crammed into a small display that is seen everyday by anyone who happens to walk by. Go back to see Scott's last project. Go forward to see Scott's next project. 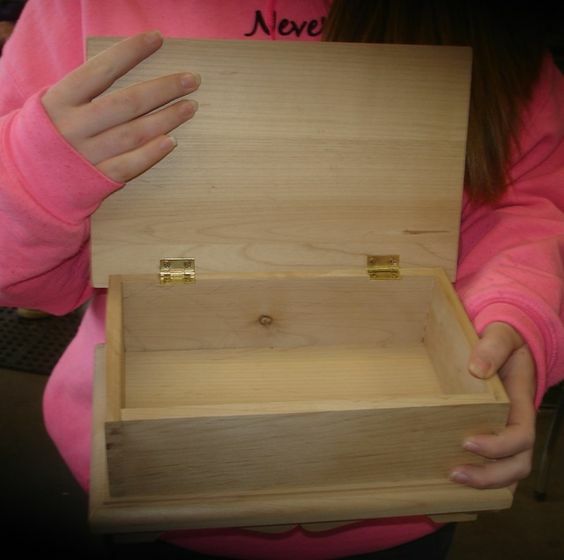 One of our recent transfer students has never had a wood shop class in her life but shows incredible natural talent as she makes project after project. 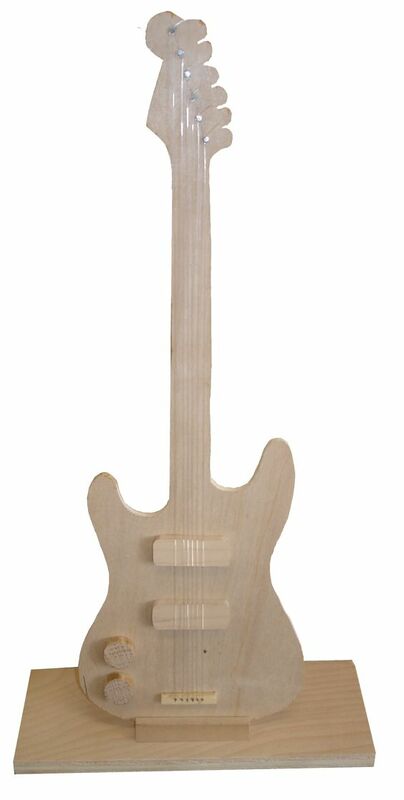 One example is this non-working electric guitar she made for her grandmother. Now I'm feeling really old when grandma prizes electric guitars enough that granddaughters know to make them one in wood shop. Complete with strings, pick up, and knobs, the only thing that could add to it would be a pickguard which she didn't want, and maybe a cool color which she also didn't seem to want. But it is OK as I've seen many times before with many students over the years.... she was simply too excited to take it home that very day!